First line: "Seth knew the moment Aislinn slipped into the house; the slight rise in temperature would've told him even if he hadn't seen the glimmer of sunlight in the middle of the night." The third book in the Wicked Lovely series returns to Aislinn's perspective as she continues to navigate the intersection of the mortal and faery realms. Having defeated the Winter Queen's curse, she has transformed from awkward high-schooler into the faery Summer Queen, taking her place beside her faery king consort, Keenan. Meanwhile, her all-too-human boyfriend Seth is unfortunately no longer able to bear her burning touch. Keenan faces a similar problem with his former lover, the Winter Girl, Donia, who has now taken the deposed Winter Queen's place. In truth, I found Aislinn so very changed by all she had experienced in Wicked Lovely, at times I almost forgot that she was the same character. Gone is the shy, fearful girl with second sight. This new Aislinn might be somewhat new to her role as the Summer Queen, but that doesn't stop her from being outspoken and attempting to bully her new faery subjects into submission. Plenty of political machinations follow, with the Summer and Winter Courts now in accord, and Winter's influence ebbing, the Dark Court (featured in Ink Exchange) is in trouble. Bananach, a faery patron of War, has long affiliated herself with the Dark Court, but sensing trouble, she goes to her sister, Sorcha, the Queen of the High Court to make threats. With Keenan's and Aislinn's attraction growing as the summer season waxes, frustrated Seth decides the only solution is to become a faery himself. Hoping to sow further strife, Bananach brings him before the reclusive High Queen, who agrees to grant him immortality, as long as he agrees to spend part of the year with her. Much to my surprise, the two of them develop a mother-son relationship, with Sorcha feeling fiercely protective of Seth. What she fails to tell him is that a few days in her realm equal months on the mortal plane. When Seth finally returns to Aislinn, he is mortified to discover that nearly half a year, she's finally given up on him, and has begun to settle down with Keenan. Readers should definitely start at the beginning of the series, with Wicked Lovely. This book, the middle of the quintet, shares many characteristics typical of a second book in a trilogy; a complex backstory which requires coming to the book with a firm foundation in the world that Marr has built, a complicated web of romance and intrigue with less plot advancement, and a cliffhanger ending which leaves much unresolved. 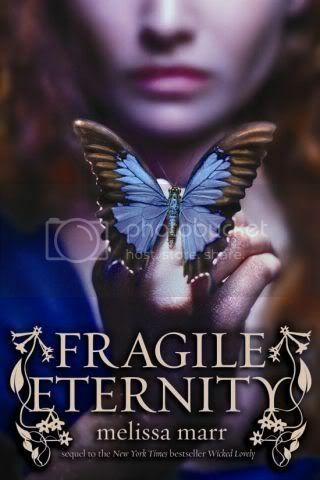 Fans of urban fantasy will find this alternate take on immortality interesting.